I thought I would try to collate some of the interesting and thought-provoking comments on the Bring Back Column Addition Facebook page, to help bring new readers up to date with the discussion, but also to respond to some of the points that have been raised. The message from parents is loud and clear. Parents are being “told off” for teaching their young children column addition, and frustrated that their children aren’t allowed to use it. 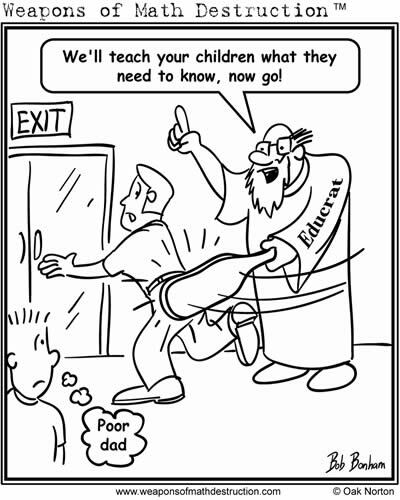 Other examples of friction between parents and teachers are cited. Educators on this page tend not to acknowledge parents’ frustrations. Their views are much along the same lines: children should not learn column addition (and other column-based methods) until they are ready to understand how and why it works. I think these responses sum up my own position pretty well, and I’m glad that people can hear these things from people other than me. Column addition can be taught with meaning to children from an early age. Educationists who say otherwise are scaremongering. It might have been true (in the 1980s perhaps) that arithmetical methods weren’t always taught with meaning, but I have no intention of letting that happen again. If the teachers on this page are anything to go by, they are very eager to promote understanding, which is great. Coupled with our modern culture of encouraging children to question how our world works, I remain optimistic that mistakes of the past won’t be repeated. But let me address some of these points myself. Place value: For anyone who uses place value as an excuse for delaying the teaching of column addition until Stage Six, I have to ask: which of the mental “strategies” introduced before Stage Six do not require a firm grasp of place value?? Teaching place value in and of itself needs to be done, but it’s only when we actually try to work with numbers that place value takes on more meaning. It is entirely natural to align numbers in columns, precisely to emphasise the place value of each digit. Approximation: Personally, I would compute the answer first and check its reasonableness using approximation. Yes, this is ultimately where we would like our children to be, but approximation is a completely independent skill. (We should be encouraging approximation when using a calculator too.) Approximation is not a prerequisite for learning column addition. Ready for bigger numbers: Admittedly, the confectionary Hundreds and Thousands tends to be called Sprinkles these days (- I hope this wasn’t a Ministry of Education mandate! ), but no matter how hard we try, children’s natural curiosity will propel them to discover larger numbers before we think they are “ready”. It is our responsibility to ensure they have the skills to keep up with that natural curiosity. If a young child wonders how many 125ml cups of water will fill a 500ml jug, what sort of teacher would I be if I said “Forget it, kid, you’re not ready for large numbers”? I, for one, would find any possible way of helping this child to work out the answer. If column addition simplifies the task and achieves the goal, well frankly I think that’s fantastic. Understanding: Now this is the big philosophical question! How much should anyone understand of a method before they are permitted to use it? Mark Newman’s real-world analogies are perfect. My own favourite: do we insist that everyone learns about the mechanics of a car before they learn to drive? Should we insist that teachers learn some Abelian group theory and commutative ring theory before they are permitted to teach the “strategies”? Don’t worry, I don’t expect everyone to understand that last question, and the good news is you don’t have to! In practical terms, one only needs to understand enough to do the current job well. If the next job is a little bit harder, then we might need to understand a little bit more. This is a very natural way of learning and it suits children very well. We can teach children to perform a task well, but we flatter ourselves if we believe we can make them understand it conceptually. Understanding is intangible and organic, and those “lightbulb” moments we sometimes see are mostly due to their natural maturation. All we can do in the meantime is support them with age-appropriate explanations and good role modelling to promote better understanding in the future. For something like column addition, that might mean teaching in conjunction with materials, promoting understanding through the language we use, wise placement of the “carry digits”. These things should help children to understand place value. Perhaps teachers feel column addition is a single page in the instruction manual, to be taught once and only once. We need to foster a culture of collective responsibility, i.e. continued support of a pupil’s understanding across many years; where it is okay for teachers of younger students to teach a method with an expectation of proficiency, but not necessarily an expectation of “full” understanding. However, the method should be revisited many times, not least because its merits will need to be discussed relative to other methods of computation. Teachers of older students should have a higher expectation of understanding from their pupils, especially those who have exhibited proficiency for some time. On the other hand, assuming their pupils are proficient, teachers may feel time is better spent understanding applications or higher-level concepts. There needs to be some flexibility here. I would welcome more comments from (intermediate and) secondary school teachers, since the ultimate goal is surely to prepare primary school students for higher-level learning. Polarised views between teachers and parents can hardly be conducive to a successful home & school partnership. I firmly believe that parental involvement is critical to a young child’s success with maths, or any other subject for that matter. Parents and teachers need to be on the same page, and parents need to be involved as much as possible. I’d really like to see better alliances being forged. Teachers, if you don’t like parents teaching their children column addition, then get in first! Make sure it is taught well; make sure your pupils are thinking about things in the right way. I’ve suggested a few ways to promote understanding. What other ideas do you have? “Algorithms” and “strategies” are divisive labels. We should abandon them. They are all methods, each with their own advantages and disadvantages. We should help students to use the methods that work best for them.